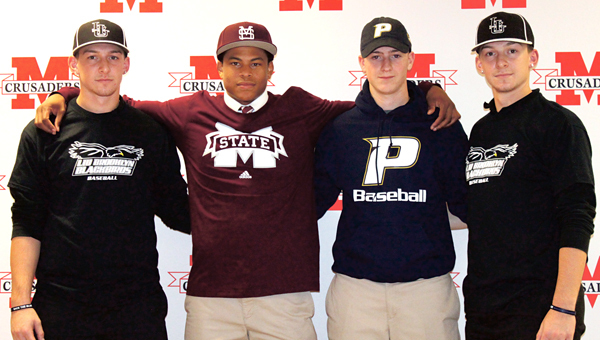 In the photo, from left, seniors Charlie Neuweiler, Quentin Holmes, Brandon Demma and Ryan Neuweiler signed their letters in front of family members, coaches, school faculty and members of the Crusaders’ junior varsity and varsity baseball teams. Holmes, the team’s center fielder and the only four-year varsity player during Melito’s coaching career, is heading to Mississippi State University, Starkville, Miss. He is a team captain and a three-time Tablet All-Star. Both Ryan and Charlie Neuweiler, also team captains, will be playing ball at Long Island University’s Brooklyn campus. Charlie is the team’s No. 1 pitcher and is a two-time Tablet All-Star, while Ryan is the team’s starting shortstop, No. 2 pitcher and was a Tablet All-Star in 2016 and an honorable mention selection in 2015. The left-handed pitcher Demma signed on to pitch at Pace University, Pleasantville, N.Y.